As an instructor, you can create a discussion for your course. This lesson outlines a variety of options to choose from in order to customize a discussion for your course. Note: Discussions can be graded or ungraded. If a student attaches a file to an ungraded discussion, the file size counts toward the student's storage quotas. However, attachments added to graded discussions do not count toward the student's storage quotas. In the Title field , create a title for your discussion. Use the Rich Content Editor  to create content for your discussion. The Rich Content Editor includes a word count display below the bottom right corner of the text box. You can also add links, files, and images to the discussion using the content selector . 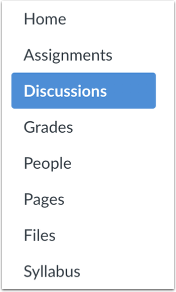 If you want to create a section-specific discussion that is not graded, select one or multiple sections in the Post to drop-down menu . Graded section-specific discussions must be created as part of the Graded option in the next section. You can also add an attachment to your discussion by clicking the Choose File button . By default, discussions are created as focused discussions. To create a threaded discussion, click the Allow threaded replies checkbox . To require users to reply to the discussion before they can see any other replies, click the Users must post before seeing replies checkbox . To enable a discussion podcast feed, click the Enable podcast feed checkbox . To allow students to like discussion replies, click the Allow liking checkbox . To add an ungraded discussion to the student to-do list, click the Add to student to-do checkbox . 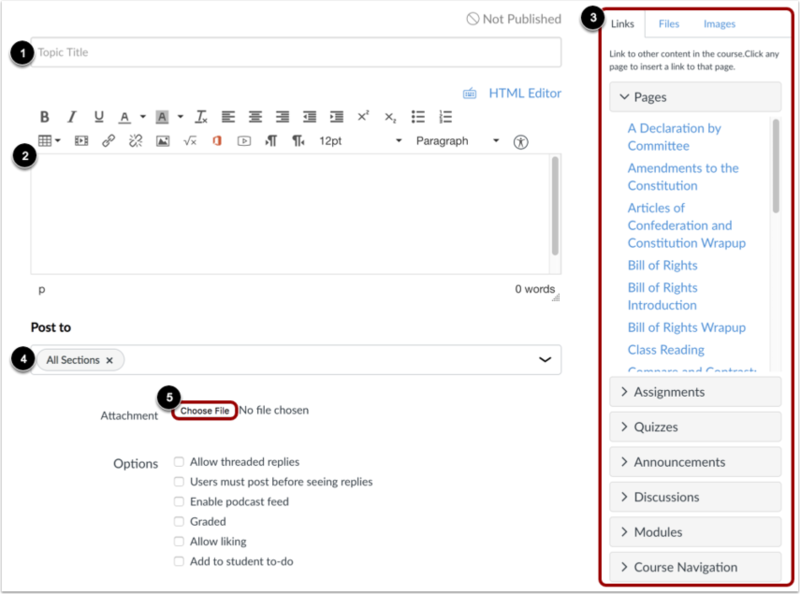 Student to-do items display in the course calendar, in the student-specific List View Dashboard, and in the global and course home page to-do lists. Graded discussions automatically display in a student's to-do list. To make the discussion a group discussion, click the This is a Group Discussion checkbox . To make your discussion available on a specific date or during a specific date range using availability dates, enter the dates in the Available From and Until fields , or click the calendar icons to select dates. If you create a graded discussion, the Available From and Until dates can be set in the Assign field. Before the Available From date, students will only be able to view the discussion title. After the Until date, students can view the discussion topic and all responses but cannot add or edit any responses. To create a graded discussion, click the Graded checkbox. 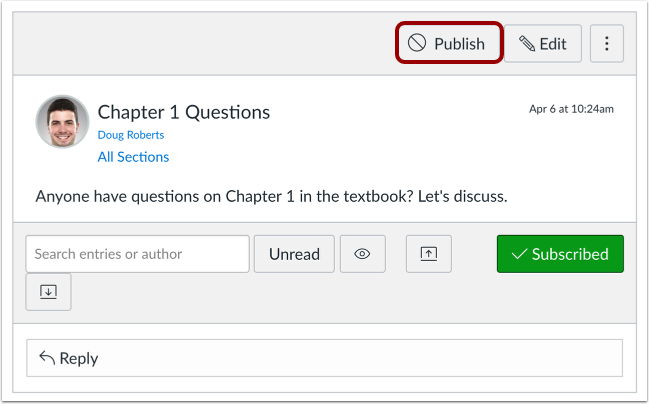 If this option is selected, additional options will be added to the page, where you can assign graded discussions to everyone, individual students, course sections, or course groups. 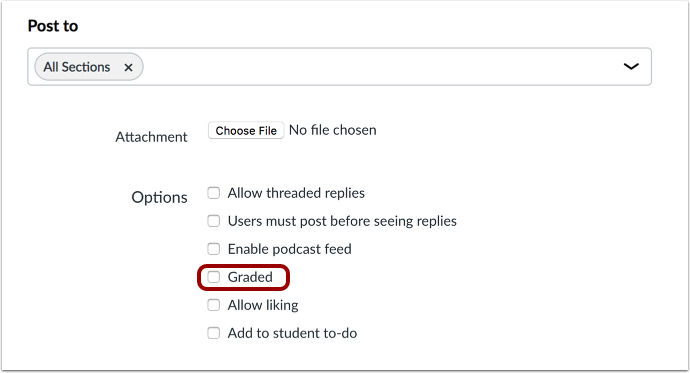 Note: If you want to create a graded discussion and you have added sections in the Post To field, the Graded option will be unavailable. You must remove the sections from the Post To field before selecting this option. 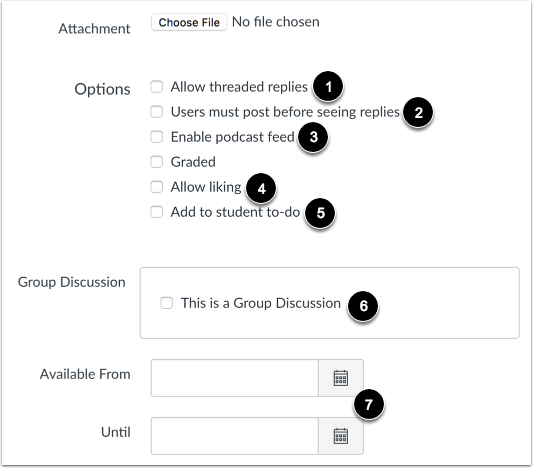 You will be able to add sections as part of the graded discussion options. When your discussion is saved in a draft state, you can return to the page and publish it at any time by clicking the Publish icon. Previous Topic:How do I use the Discussions Index Page? Next Topic:How do I create a group discussion in a course? Table of Contents > Discussions > How do I create a discussion as an instructor? Re: s there a way to thread discussions so that they are collapsible and easier to sort through and not one continuous thread?